As a plant construction firm for snowmaking systems, the number one priority for TechnoAlpin is the timely realization of construction projects in the narrow timeframe of the shoulder season. The company, headquartered in Bozen/Italy, completes approximately 300 projects a year. This requires meticulous planning and organization, right down to the very last bolt and screw on site. With the company’s success came a sharp increase in quantity of orders, and subsequently the projects became more complex. At that point, project management was done with spreadsheets, often resulting in overlaps and causing TechnoAlpin to realize that it was time to modernize and simplify their project planning and management. About two years ago, TechnoAlpin set a goal to find a comprehensive, intuitive and coherent software solution to manage all their projects. They started by doing some market research and compared several solutions based on their functionality and specifications. They immediately ruled out large, complex PM solutions that offered a multitude of features, of which only a small portion would be used in practice. That narrowed down their choices to those that offered a compact, intuitive, and clearly structured solution. Another important criteria was that TechnoAlpin is ISO-certified and has thus established certain standardized processes, which the new system must be able to support. Another hindrance to smooth project processes was the frequent overlap of projects, which posed a major challenge in terms of coordinating resources. “In the end, it was no longer possible to handle all of this with Excel,” Dusini said. TechnoAlpin did not have any specific demands for a software solution, other than that the PM software needed to be easy-to-handle and intuitive. The project managers’ goal was to get everyone involved in projects to use the software, and discussed several options including Sharepoint with in-house coding. Coincidence then brought them to InLoox. One of their engineers, who was also involved in their market search efforts to find a fitting PM solution, noticed an InLoox company car and looked up the company. After a live web demo the TechnoAlpin project teams were convinced that they finally found the right project management solution for their needs, and they chose InLoox PM for Outlook. The ensuing implementation by the distributor IQ Sales in the TechnoAlpin infrastructure coincided with a project management course with the Project Management Institute (PMI), which prepared the project management team for a new kind of PM process. “Even though the implementation of InLoox is happening during our peak season, it already takes some weight off our shoulders,” said Dusini. At the moment, InLoox PM 8 is used by 22 clients at TechnoAlpin. At the moment, the InLoox project management solution is used in the Contract Management department, TechnoAlpin’s project management office. In due course, further departments, including Purchasing, Service, and Production, will integrate InLoox into their processes. This year, the project managers will only use the software for key projects, and in the coming season the software will be used for all projects, aside from sales. Thus far, project managers report that their work is more structured. The scheduling and notes functions, the ability to assign tasks, and regular status update emails that automatically add the project number to the subject line have noticeably simplified the communication and information sharing processes among staff. TechnoAlpin employees are expecting noticeable time savings as a result of streamlining processes. For example, the notes function is expected to significantly improve the process of addressing problems and challenges as they arise. In the past, this was often left undocumented due to time restraints, and it was not possible to deal with the problems immediately. This led to unaddressed and eventually forgotten difficulties , causing the company to miss out on the opportunity to learn from past experiences, develop coping strategies and improve their processes. The notes function on tasks and projects makes generating reports a lot easier and facilitates a productive problem solving environment. TechnoAlpin has been designing and providing custom-built snowmaking systems for ski resorts worldwide since 1990. In 2014, the expertise developed over many years by the company York Neige was also integrated under the TechnoAlpin umbrella, resulting in an even wider range of quality products and an even stronger and sharper development department. TechnoAlpin and York Neige boast, respectively, over 20 and almost 40 years of experience, adding up to an unbeatable level of expertise that more than 1,800 customers worldwide count on. 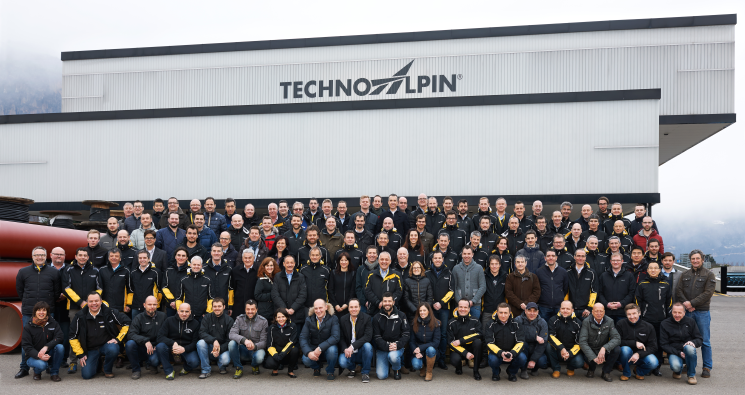 TechnoAlpin has 35 branches all over the world guaranteeing expert customer care and support. TechnoAlpin - InLoox • Copyright 1999-2019 © InLoox, Inc. All rights reserved.